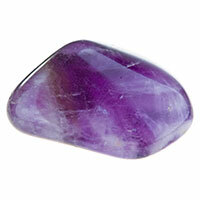 "Any possibility can be your reality," is Amethyst's affirmation. Containing qualities of purification and protection, this crystal is especially powerful for those under the signs of Virgo, Capricorn, Aquarius and Pisces. This crystal is known to help with physical issues involving the blood and immune system, but also to aid in healing addictions, which can be useful for Aquarius and Pisces, who tend to be more susceptible to coming under the influence of drugs, alcohol and anything that can help them to escape from the world. Interestingly, Amethyst is also thought to affect our dreams, so if you have been suffering from a particularly bad set of night visions, try wearing amethyst on your body, or keeping it under your pillow for protection against nightmares, and to bring on softer, more positive dreaming. As it's primary chakra os the Third Eye Chakra, meditating upon that area could be particularly beneficial before heading to bed for the night. The Right Healing Crystals for Everyone On Your Gift List - by Zodiac Sign!